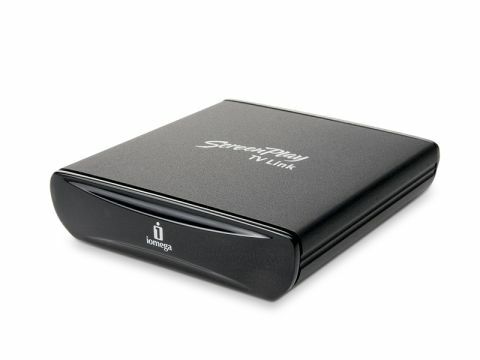 Iomega's ScreenPlay TV Link provides one of the better value options on the market. It consists of a small black box that has a USB input alongside a choice of connections for your TV set. A touch smaller in size than an old-fashioned audio cassette, it boasts HDMI, Scart, component or composite video outputs and comes with all of the necessary cables bundled, with the exception of the HDMI. Simply plug in a memory stick or hard drive (via USB of course), select the right channel on screen and then select the file you'd like to watch or listen to. There's a small remote control so that you can do all of this from the comfort of your sofa, and the box itself is mains powered so you don't have to worry about replacing costly batteries. Setup really couldn't be simpler and the onscreen menus are clean and intuitive enough for even those that aren't familiar with PCs to navigate with ease. Compatibility includes MP3, WAV, WMA and OGG for music, AVI, DivX, MPEG1, 2 and 4 for movies and JPEG for stills. Our tests with a variety of (legally) downloaded material reveal no loss of quality from stills, while MP3s play back as well as our test screen's feeble speakers will allow. Movies look as good as the originals and often look better, if using the HDMI to upscale to 1080i. Best of all, the ScreenPlay TV Link is ultra portable so you can take it to friends' and relatives' homes to show your pictures and movies.